Safety has long been a touchstone in the construction industry, but new trends offer exciting possibilities to improve the well-being of construction workers. “Safety Management in the Construction Industry 2017 SmartMarket Report,” a recent study by Dodge Data & Analytics, in partnership with The Center for Construction Research and Training (CPWR) and United Rentals, offers insight into new technologies and processes with potential to transform the pursuit of safety on construction sites. The study is the third in a series since 2012 that examines safety management. All three asked contractors what benefits they have experienced from safety-related investments. These benefits have consistently included the betterment of project outcomes, such as higher quality, reduction in reportable injuries and substantial business benefits, like improved reputational standing, increased ability to contract new work and higher levels of staff attraction and retention. In addition to looking at the prevalence of top practices and trends in training, the latest study also looks at two areas with the potential to dramatically alter safety practices and outcomes—the impact of new technologies and the emerging trends of prevention through design (PtD). With a two-pronged approach, the 2017 study looked at the impacts of technology on safety. First, it asked questions about the safety impacts of building information modeling (BIM)—the same questions asked 5 years earlier in the 2012 study—to test how those results have evolved. Second, it benchmarked the use of newer technologies like drones, wearables and laser scanning along with the degree to which early adopters are seeing safety-related impacts from their use. Drones—Twenty-one percent of contractors use drones on-site. Among those using drones, 70 percent report that they have a positive impact on site safety. Laser scanning—Fourteen percent of contractors use laser scanning on-site, and 76 percent of them report a positive impact on site safety from this use. Wearable devices—Thirteen percent of contractors use technology, such as smart helmets and badges with coded information, and 82 percent of them say that these devices improve safety on-site. Right now, only early adopters—mainly large contractors with 500 or more employees—are using these products. However, these findings suggest that as prices decrease and various applications allowing site conditions to be digitally captured and analyzed continue to emerge, site safety will improve due to wider adoption of such technologies, forming a baseline that will help track the technologies’ usefulness moving forward. Over half of the contractors who participated in the 2017 study use BIM, either by creating models themselves or by using models created by others. 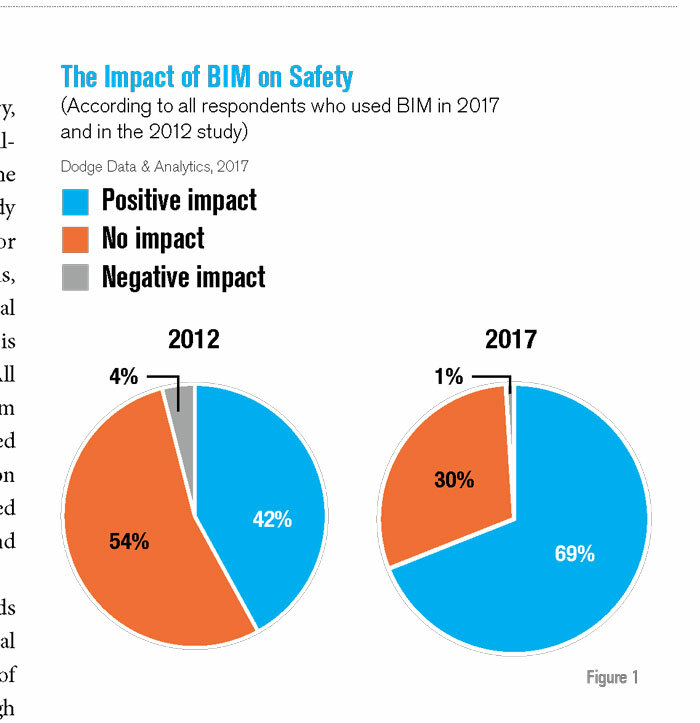 As illustrated in Figure 1, more than two thirds of these respondents (69 percent) reported a positive safety impact from BIM use—a significant increase from the 2012 number of 42 percent. Many factors contribute to the growing recognition of BIM’s safety potential, including more experience with BIM among contractors and wider access to BIM tools and capabilities. So, how does BIM actually influence safety on the jobsite? Nearly all users (82 percent) see positive impacts from using BIM to identify possible site hazards before construction begins. Almost two thirds (61 percent) also find that using BIM for clash detection improves safety, and more than half agree that the ability of the model to support prefabrication and create 3-D images has positive safety impacts. Notably, the study finds that more BIM users than non-users experience project and financial benefits from their safety investments, including improved project quality, reduced reportable injury rates, improved adherence to schedule, increased ability to contract new work and improved standing in the industry. Overall, the findings on BIM suggest that contractors’ ability to capitalize on models to improve safety on-site has increased over time, and that trend is likely to continue as BIM capabilities evolve and more companies adopt the technology. As a practice, PtD embeds safer building construction and operations directly into the early design stages of new projects. The National Institute for Occupational Safety and Health (NIOSH) formally defines PtD as involving “all of the efforts to anticipate and design out hazards to workers in facilities, work methods and operations, processes, equipment, tools, products, materials, new technologies and the organization of work.” While a common practice in countries like Singapore and the United Kingdom, PtD is still emerging in the United States., despite the fact that multiple studies link between 22 and 63 percent of global workplace fatalities to design-related factors. PtD can, therefore, play an important role in improving construction safety. The findings reported in the 2017 SmartMarket Report, depicted in Figure 2, demonstrate that, especially among the design community, PtD is not well known as a formal practice. 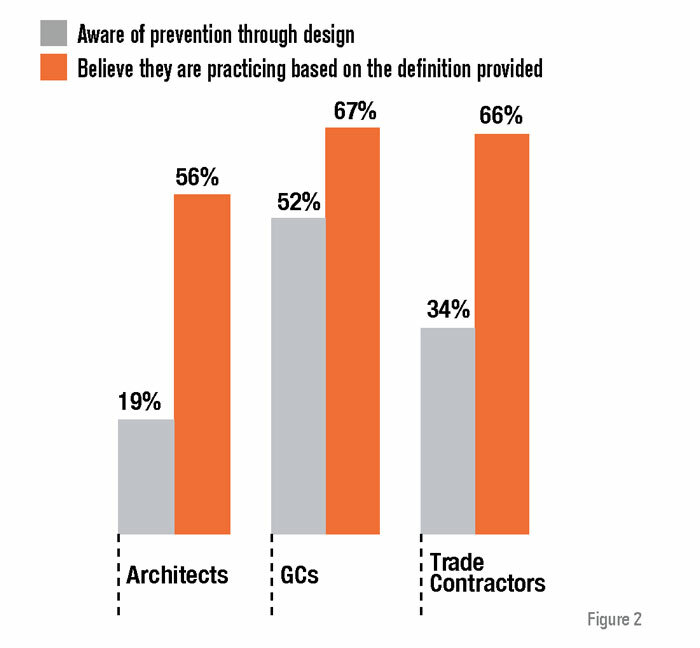 Before survey takers were shown a specific definition of PtD, only 19 percent of architects reported being aware of it. Trade contactors were marginally better at 34 percent, and general contractors (GCs) had the widest awareness at 52 percent. While this demonstrated that most companies are largely unfamiliar with PtD, many are already using practices it encourages. The 2017 study asked architects if they engage in four specific PtD practices. The most common, reported by 83 percent, is working with (GCs) and specialty tradesmen to identify opportunities for prefabrication before the completion of schematic design. Prefabrication can have a significant impact on project safety. In a case study of a hospital project in Denver, Colorado, the featured company—Mortenson Construction—estimated that they were able to avoid eight potential safety incidents due to prefabrication of bathroom pods, exterior wall panels, multi-trade racks and patient room headwalls. Unfortunately, the opportunities for prefabrication are currently still limited, and other studies conducted by Dodge, such as the Q12018 Commercial Construction Index, demonstrate that while many companies use prefabrication, most do so to a limited degree, and project design that does not lend itself to prefabrication is a top obstacle. Therefore, while prefabrication is an important strategy to improve safety, other approaches are also necessary to make a significant difference. room surface. The study findings illuminate clear opportunities to increase the use of PtD, both by boosting awareness of the principles among architects and garnering familiarity with specific practices. However, there are obstacles to increasing PtD use among architects, particularly in the U.S., that are yet to be overcome. Many architects are hesitant to perform safety constructability reviews before completion of schematic design. More than three quarters (79 percent) report that concern about taking on construction liability is a major barrier preventing them from practicing PtD. Another issue— reported by 63 percent—is the lack of client interest. These numbers suggest that owner engagement may be the most critical factor for encouraging wider PtD adoption. In fact, 81 percent of architects report that owner or client request would be highly influential in encouraging them to practice PtD. These findings demonstrate that there is great potential for further utilization of PtD, and that to encourage this, the biggest effort needs to be in education for business owners. Informed owners who understand they can foster safer construction projects by having design teams that consider construction safety during early schematics help encourage architects to engage in the behavior as well. In addition, consideration of how to handle liability for architects so that they are not inadvertently punished for practicing PtD, is also key for increased adoption in the U.S. Together, technology and PtD practices have the potential to improve safety on jobsites and deliver more successful project outcomes. Donna Laquidara-Carr, Ph.D., LEED AP is research director for the Industry Insights division of Dodge Data & Analytics. Visit construction.com.